Appearance: Dovepaw is a white cat with long soft hair. She has green-blue eyes that stick out in her white hair. She also has very thich hair that blends in and keeps her warm during the winter. She has a small star shaped birthmark, her mom used to joke that it was given to her from Starclan when she was just a kit. She has small pointy ears that stick straight up and a long, thin tail that usually hangs down. Personality: Dovepaw has a very sweet and calm personality. She loves to hang around kits and queens, sometimes she will hang around Toms but that is not very likely just because a bunch of rouge Toms killed her parents when she was little. She loves to hang around her mentor and will often tease her. 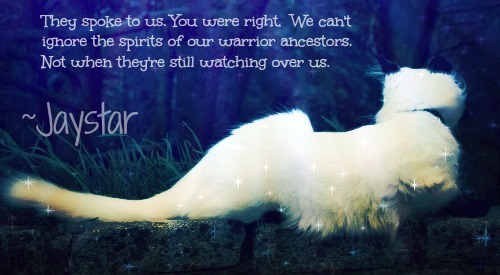 She wishes she got visions from Starclan but so far they have revealed nothing to her. She is also very good with herbs and has almost all of them memorized. She also can keep her cool when she sees a sick cat. She always thinks everybody has a good personality unless you prove her otherwise. History: It was a cold summer night, the wind was howling and everybody was tucked up in there beds. But there was one kit that was out, Dovekit. She didn't care for the cold and wanted to play moss-ball with her siblings. As they were playing she got distracted and started to wander off. As she was walking she heard some whispering, it was a group of Toms that were talking. As she got closer she was able to hear what they were saying. They were talking about raiding Thunderclan! Dovekit got nervous and started to run to the twoleg nests. As she hid there she could hear screams of cats in battle. On accident she fell asleep and the next morning as she got up she smelled blood. As she walked back into camp there were dead cats everywhere and some hurt ones as well, she noticed her siblings bodies all in a clump and her mom's was over to the side. She then noticed her dad was being treated, but his gash was to big and would not heal. She went over to the Medicine Cat and asked if she could help. The Medicine Cat said she could take the herbs over to the den. She did and as she came back she started to help the Medicine Cat more and more. Later when she became a paw she asked if she could be the Medicine Cat Apprentice, the leader said yes. So that is where she is today. ~Accepted!~ Welcome to the Clans! Welcome to Thunderclan! My name is Jaystar, your clan leader!